Just in case your company decides to interact with the 1 billion monthly active users on WeChat. While most people are quite familiar with Facebook chatbot. Because it’s a Chinese software and you can’t just Google your way out if you’re stuck. Even if you Baidu, you will likely end up at Segmentfault(Chinese version of Stack overflow). So this article’s purpose is to get your feet wet with WeChat Public Platform. Scan the QR code with WeChat app. You can use chrome’s translation plugin to translate the page. appID, URL, Token are the only fields we need to worry about for this chatbot. Or do npm install instead of yarn if you’re allergic to yarn. Create a file called .env at the project’s root folder. If no errors pop up, feel good about yourself. Once ngrok is online, copy the url from your terminal. Put it in URL field in the sandbox account dashboard. Make sure you add /wechat at the end of the url. If something green pop up at the top, it means that WeChat has successfully bind your url to the sandbox account. If you scroll down on your sandbox account dashboard, you will see a QR code. Scan it and begin sending it random things. Start to mess around with the code. Tencent server sends request to the URL to confirm if the token matches. 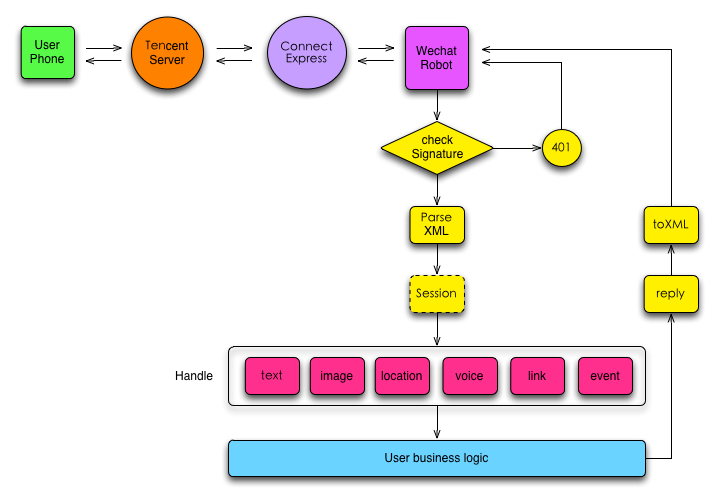 Tencent server expects a XML format of the user’s OpenID and the content of the message. OpenID is WeChat user’s ID related to the Public Platform. WeChat notifies the user that the service is unavailable after three tries. Thanks to library by Jackson Tian. His library takes care of the logic that authenticate the token and handle XML.